Notice that the size of US aid has shrank significantly in the last couple of years (The best way to see this is by clicking on the bar icon located in the middle of the upper-right corner of the graph.). Notice also the volatility and magnitude of US aid to the following countries: Afghanistan, Benin, Jordan, Egypt, Gambia, Georgia, Iraq, Kenya, Lesotho, Senegal, Tanzania, and Tunisia. Notice the crazy jump in “Stabilization Operations and Security Sector Reform” in 2011. Also notice the top sectors to which US aid is allocated include Infrastructure, Agriculture, HIV/AIDS, and Family Planing and Reproductive Health. The department of Defense shows a jump in spending in 2011 which might explain the behavior of theStabilization Operations and Security Sector Reform sector. U.S Agency for International Development and the Millennium Challenge Corporation are top spenders. 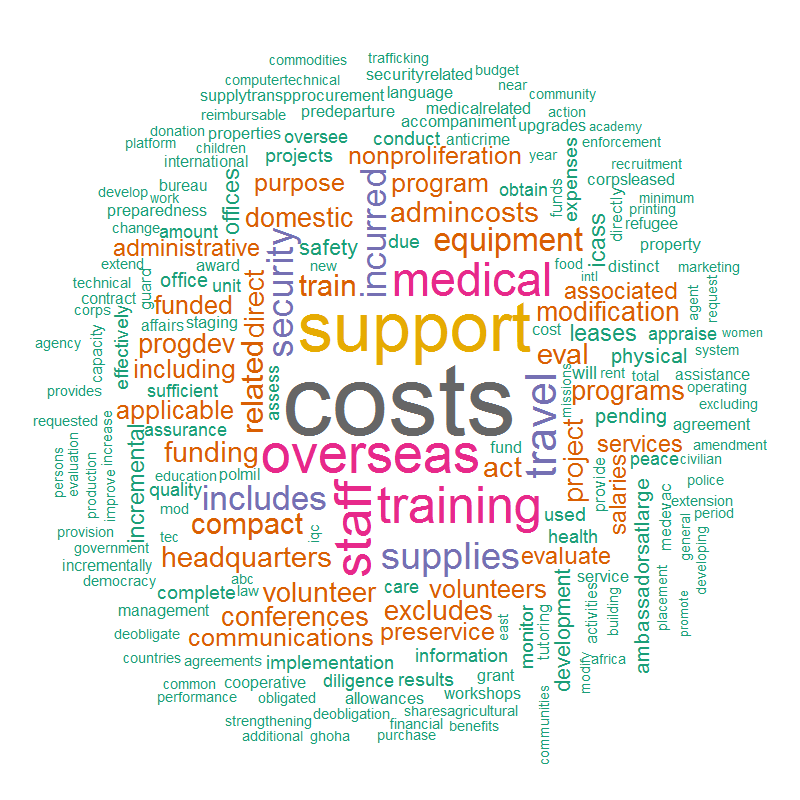 The data is from Foreignassistance.gov and the file as I downloaded it is here. The R code is here. In their widely cited paper, Alberto Alesina and David Dollar find that “the direction of foreign aid is as dictated by political and strategic considerations as by the needs and the policy performance of the recipients” (Alesina and Dollar 2000). 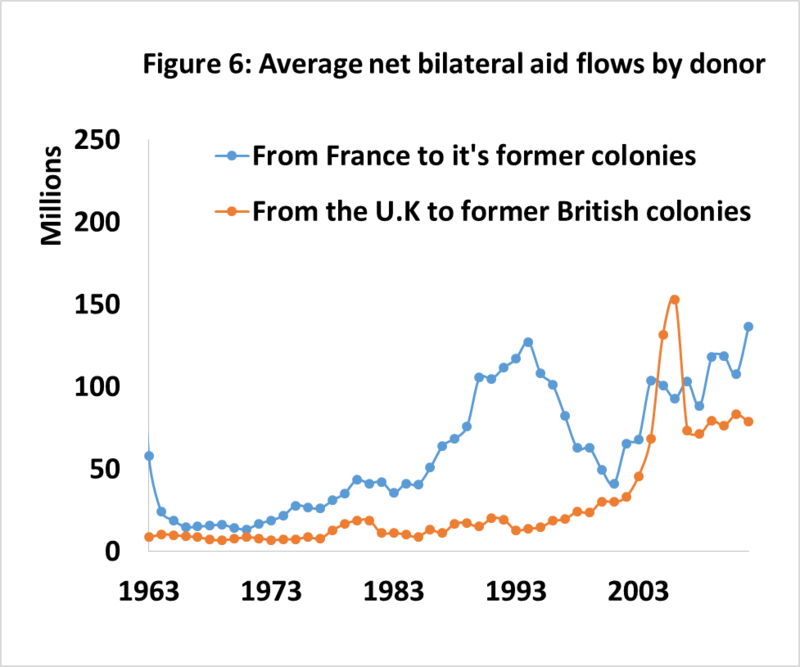 Colonial past and political alliances, they add, are major determinants of foreign aid. To see the extent to which this holds, one can compare French and British aid to each other’s colonies. 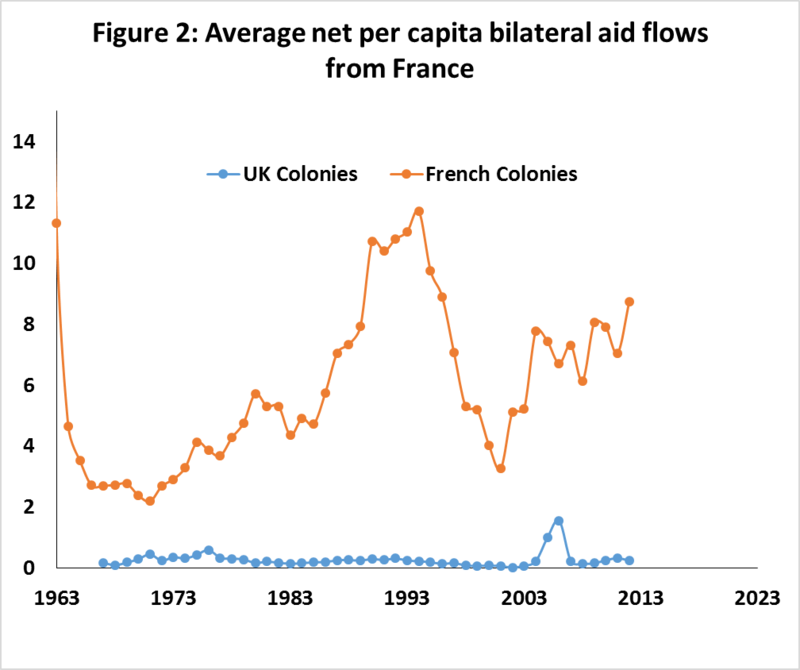 If colonial past matters, French colonies would always receive more aid from France than they do from England, and vice versa, regardless of poverty levels among aid recipients. Before doing that, however, it is important to consider that former French and British colonies differ in their population size and poverty rates 1. 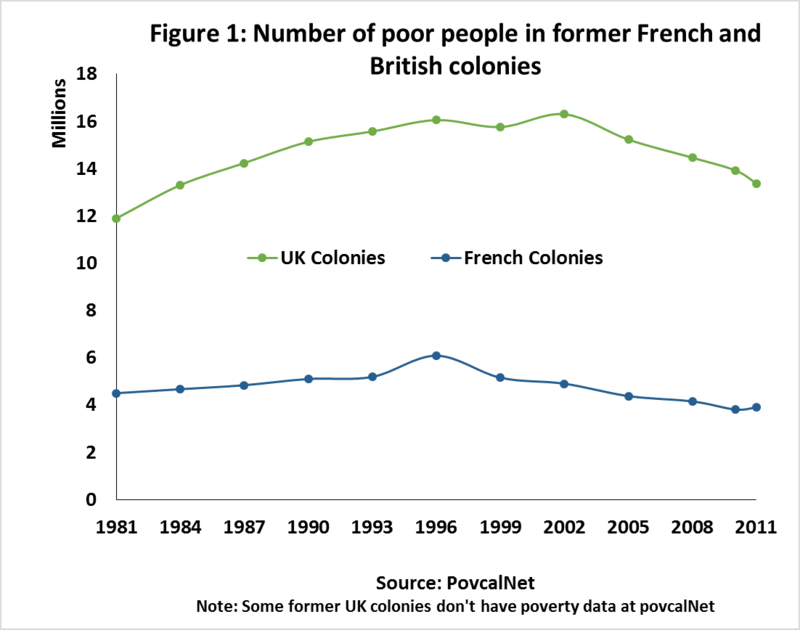 Figure 1 shows that there are far more poor people in former British colonies than in former French colonies. The average former British colony has approximately 10 million more poor people than that of France’s. That is, on average, the number of poor people in former British colonies is three times that in former French colonies. Assuming that poverty levels are the principal determinant of aid allocation, one would expect that former British colonies receive more aid per capita than those of France. However, that is not always the case. Figure 2 shows net per capita bilateral aid flows from France to the two groups of countries. On average, France disburses $6 per capita to its former colonies annually and only $0.3 per capita to former British colonies. 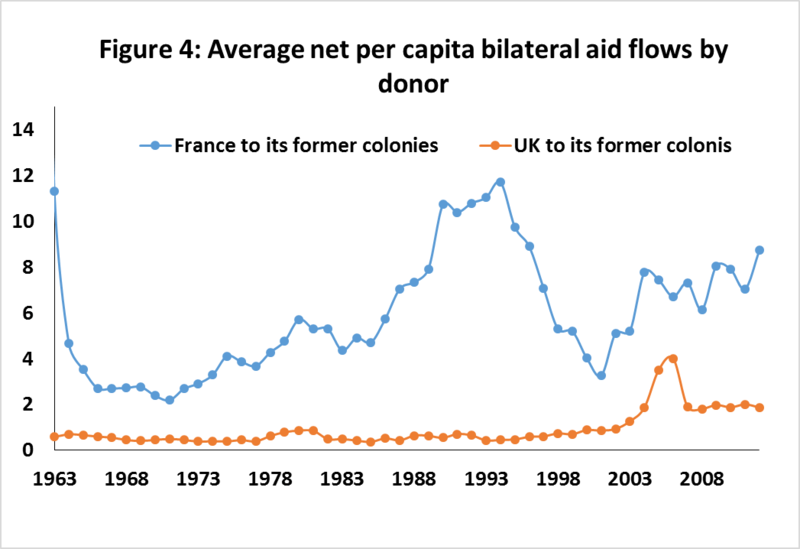 In other words, France gives out 19 times more bilateral aid per capita to its former colonies. On the other hand, the U.K disburses an average of $0.9 per capita annually to former British colonies and only one third of that to France’s (See Figure 3). To its credit, the U.K’s former colonies have roughly three times the number of poor people. Consequently, though this might be just a coincidence, one can argue that the U.K allocates its aid neutrally with respect to colonial past and in a matter consistent with poverty levels among aid recipients. 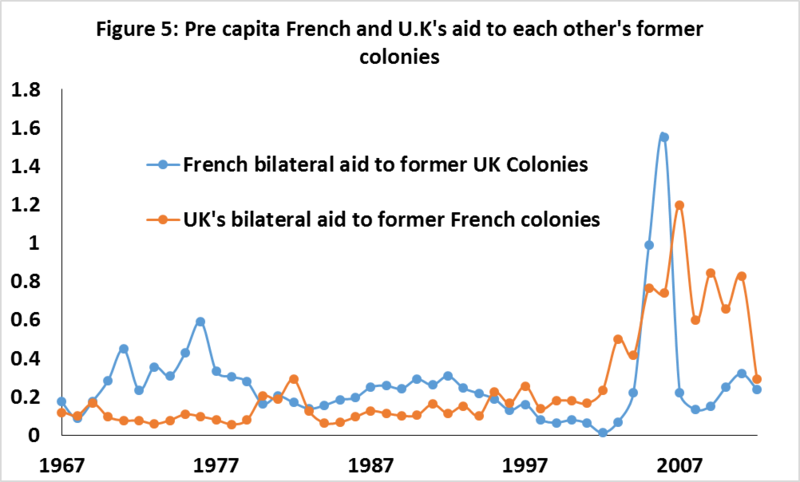 Combining the information of Figures 2 and 3 one can clearly see that France and the U.K give out substantially different levels of per capita aid to their corresponding former colonies (Figure 4). As mentioned earlier, the average former French colony receives $6 per capita in aid from France while the average former British colony receives $0.9 per capita from the U.K. On the other hand, France and the U.K. disburse the same level of bilateral aid to each other’s colonies, both giving out an average of $0.3 per capita to non-former-colonies (Figure 5). But why is the U.K’s level of aid per capita lower? One might suspect that this is a result of the bigger population of former British colonies. However, that is not the case. France simply gives out more bilateral aid than the U.K does, Figure 6. On average, former French colonies collectively receive 40 million dollars more annually from France than former British colonies receive from the U.K.
To conclude, it is clear that France does not allocate its bilateral aid neutrally. 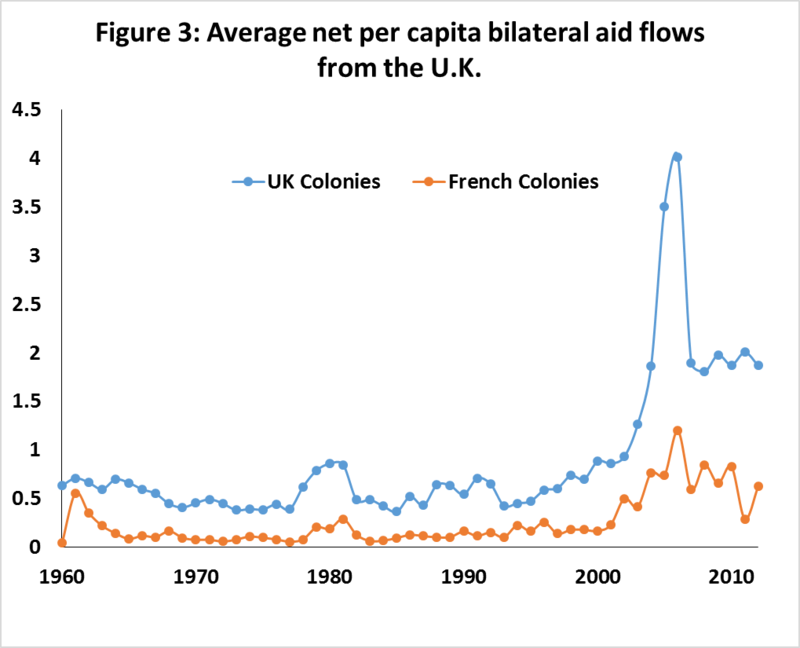 Rather, it heavily favors its former colonies despite their relatively low poverty levels compared to those of the U.K. For fairness, however, France does give out more bilateral aid than the United Kingdom. 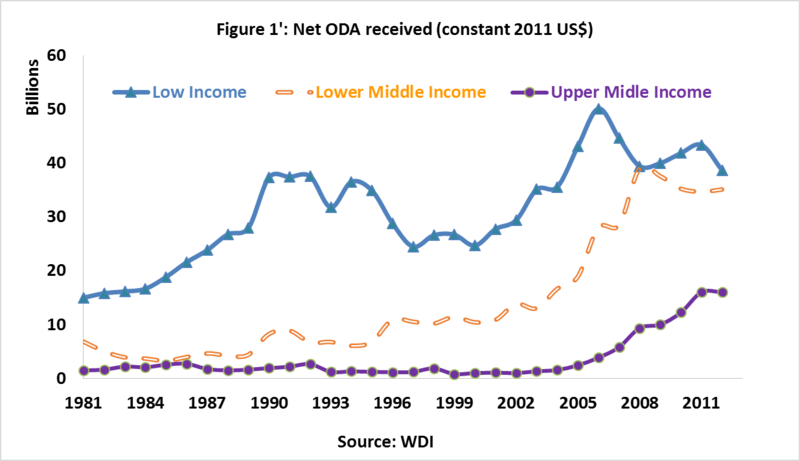 The latter, nonetheless, seems to allocate its bilateral aid flows in a manner consistent with recipients’ poverty levels. Download the data and code. 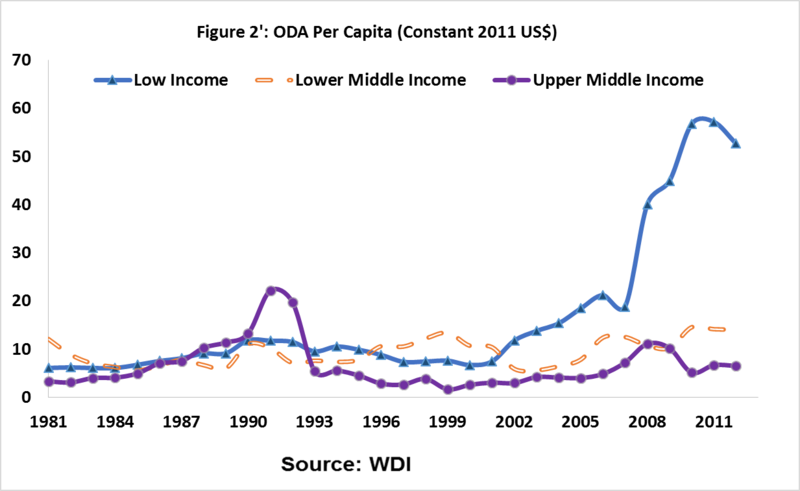 Appendix to the Post: Do Poor People and The Poorest Countries Receive The Most Aid? There are two ways to group countries by their GNI per capita. The one followed by the post Do Poor People and The Poorest Countries Receive The Most Aid tracks a group of countries based on their current per capita GNI. For instance, countries which currently fit the criteria for the middle income category are tracked over time, even though some of these may have been richer or poorer through the time period of analysis. Obviously this is limited in that, going back over time, these countries may have actually been low, not middle, income countries. Alternatively, one can set GNI per capita brackets for various groups and allow countries to fall within these groups based on those income brackets. So, throughout the time period of analysis, a country can start as a low income, move to lower middle income, and end up as an upper middle income. This is the approach followed here. Figures 1′, 2′, and 3′ are a reproduction of Figures 1, 2, and 3 in the post Do poor people and the poorest countries receive the most aid, respectively. 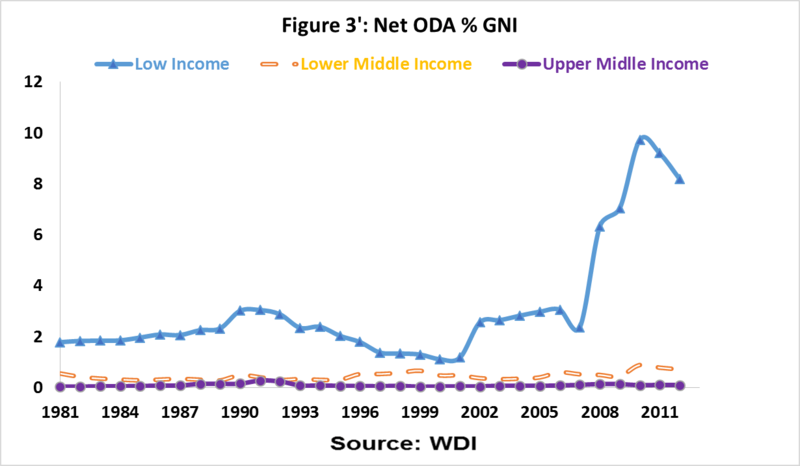 These figures produce much stronger results against the claim that ODA doesn’t get allocated towards the poorest countries. Unfortunately, figures 4 and 5 are hard to reproduce using this method because complications arising from the availability of poverty data. All the data are from WDI.